My love affair with Colombia began after only my third day in the country. Now, you might think that I am being a bit dramatic and have exaggerated the situation, but it’s true. Sometimes you just know when it’s right…it’s right. Prior to my arrival in Medellín, Colombia, I spent two months traveling around Ecuador, searching for my future retirement haven. After attending an International Living conference in November 2011 in Quito, Ecuador, I spent the rest of the month traveling down the Andes mountains checking out more of Ecuador, stopping in Otavalo, Cuenca, Loja, and Vilcabamba. Tired of packing and unpacking my suitcase every few days, I decided to park myself on the beach in Salinas, Ecuador, for the entire month of December to see if this was what I was searching for. While each of these places I visited had something special to offer, none of them resonated with me nor felt like home. So, I took the advice that one of conference speakers had given me and decided to check out Medellín, Colombia. The stunning scenery takes my breath away. Colombia is the second most biodiverse country in the world with a climate to suit everyone’s desire. I prefer to spend my time in the mountains. The lush, green Andes mountains contrast beautifully against the deep blue sky. From time to time clouds hang low and cover the peaks giving them a mystical, ethereal look. The year-round spring-like temperatures keep me comfortable. 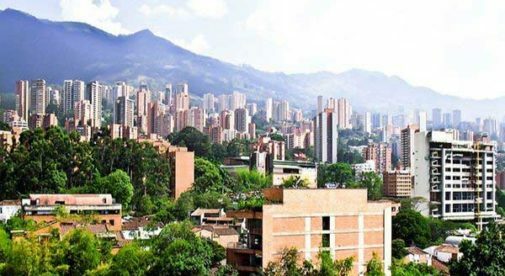 Although I live in Medellín, other cities like Bucaramanga and the eje cafetero (the Coffee Triangle) cities of Pereira, Armenia, and Manizales also have similar climates that are perfect for hiking, horseback riding, playing tennis, or just strolling through the streets. There are times when I want to enjoy the ocean, so an inexpensive one-hour flight transports me to the warm, tropical Caribbean beach cities of Cartagena and Santa Marta. There I can go boating or swim and snorkel in the crystal-clear water. After a day of soaking up the sun, I love to relax. I enjoy swinging in a hammock in the shade of a palm tree, sipping a cool drink and watching the sunset turn the sky into fiery red, yellow and orange. The country has world-class, inexpensive healthcare so I don’t have to worry about getting access to high-quality medical care should the need arise. I am covered by Colombia’s public health insurance plan. My premium is less than $70 per month, and I only pay a $4 co-pay for prescriptions, lab tests, X-rays, and other diagnostic testing. Thankfully I rarely use the health system beyond my annual physical and mammogram. I attribute this to the healthier lifestyle I have living in Colombia. I eat fresh, local produce, and meat and chicken without added chemicals. In addition to being in better physical health, my stress level has dropped dramatically from when I led a fast-paced work life. Back then I was working long hours to afford my middle-class lifestyle. I now have a higher quality of life but for 60% less than it cost me in the U.S. The close proximity to the U.S. makes it quite easy when I want to fly back to visit family and friends. A three-hour flight lands me in Florida, and in another three hours I can be in Boston or New York City. This also means that they can come and visit me on a regular basis.